La reine sait que les vietnamiens ne sont pas grands et elle ne porte que des chaussures plates .Geste élégant ! Shoes with the blue dress: not good. And I have to say that I dislike her "mix & match" of armrings, watch, rings in silver, gold and whatever she can get. It's tooo much. 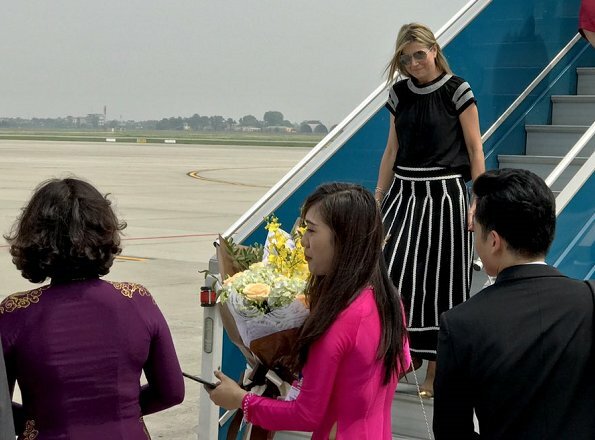 It's not about fashion, but how many "important" people did travel with her to Vietnam? Is she not wearing her usual high heels on purpose? Maybe she didn't want to look extremely tall? This outfit is very unfortunate there is not a thing I like about it, and just as I predicted the hair is much worse than usual, heat & humidity will destroy any hairdo, or maybe the hairdresser is not traveling with her. The whole black-white outfit is weird and doesn't do anything for her. The blue one is a little better, but for the shoes..